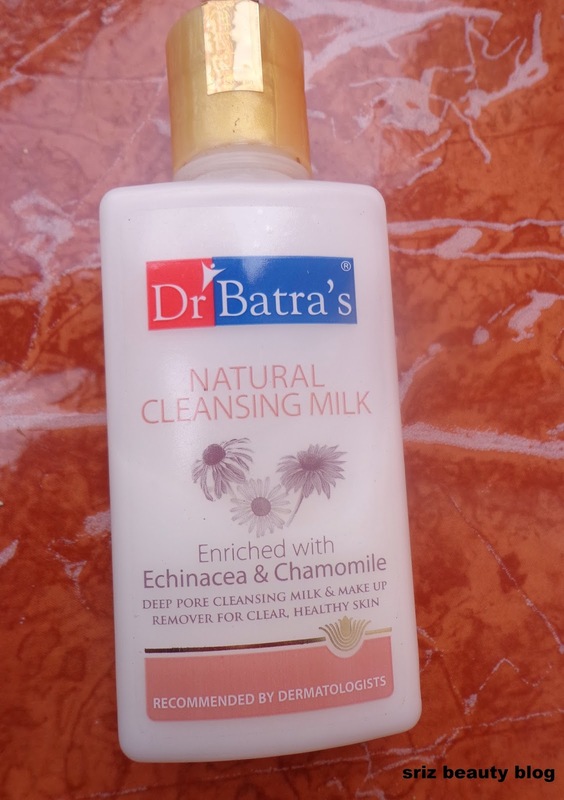 Hello Everyone, Today I am reviewing Dr Batra's Natural Cleansing Milk enriched with Echinacea and Chamomile, which is a deep pore cleansing milk & makeup remover for clear,healthy skin.I bought this some days back and I did not use it regularly and forgot about it,last week when I am running out of my makeup remover and searching for an alternative,I found this lying inside my shelf and I am using regularly from that day. Packaging : It comes in a transparent plastic bottle with a golden colored pressing lid. What the Product Claims : Echinacea slows down the degeneration of skin cells keeping skin strong,supple and youthful.Chamomile moisturizes,soothes and nourishes skin.It is also enriched with Soap nut extract which provides delicate cleansing of the skin. It is also antibacterial & may soothe the eczema, psoriasis, itchy and sensitive skin. Ingredients :Aqua,Sodium Lauryl Sarcossinate,Glycerine,Echinacea purpurea root extract,Hydrogenated olive oil, Iso prophyl myristate,Cetearyl Olivate,Olive oil PEG-7 esters,Sapindus Laurifolia fruit powder extract,Chamomile recutita flower powder,Sodium Lactate and Sodium Gluconate,Acrylates/C10-30 Alkyl Acrylate crosspolymer,Cetyl Alcohol,Sodium Benzoate,2-Bromo-2-Nitro-1,3-Propanediol,DMDM Hydantoin,perfume,Sodium hydroxide,Disodium EDTA. Directions for Use : Apply over face and neck using circular movements.Wipe Off with damp cotton or rinse with water. My Views On the Product : It is a white colored runny liquid which cleanses the skin thoroughly and effectively removes waterproof makeup like mascara,eyeliners etc., It is very reasonably priced and it has a mild scent which is not at all overwhelming. It does not dry the skin after washing and my skin feels squeaky clean. We need a little amount of product to cleanse the entire face.So,little goes a long way.